You can view and print a deposit slip for a specified date or date range. The deposit slip includes cash, check, and credit card payments from patients and electronic funds transfers (EFTs) and check payments from insurance carriers. 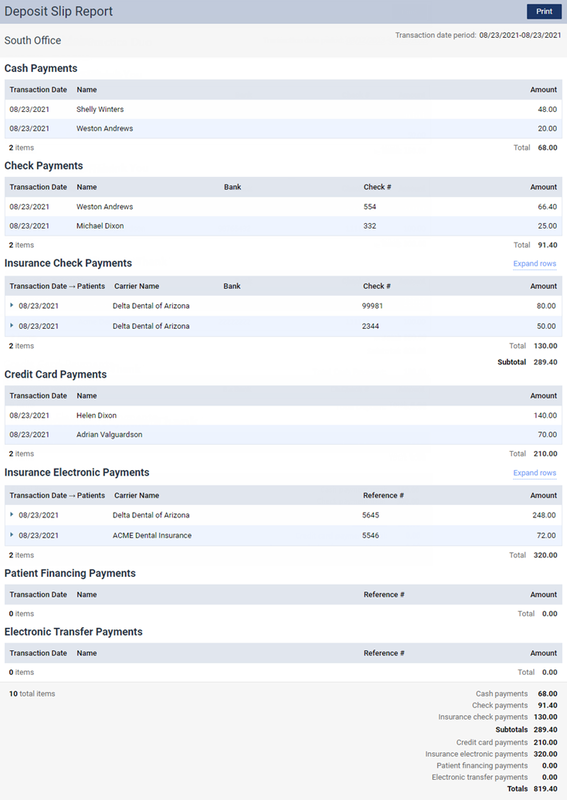 The deposit slip also displays totals for each type of payment. 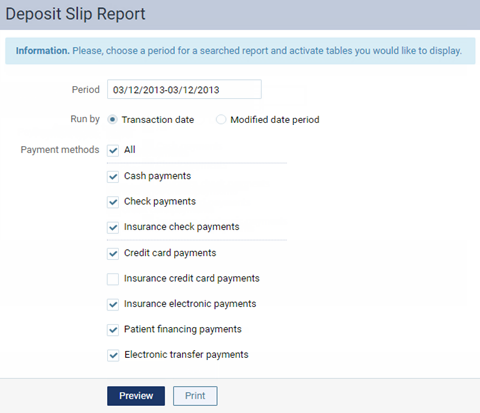 On the Home menu, under Reports, click (or tap) Deposit Slip Report. The Deposit Slip Filter page opens. The date of the deposit slip is today by default, but you can change the date. 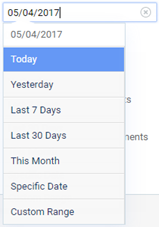 To change the date, click (or tap) in the field, and then select a date or date range. Note: You can create a deposit slip for one of the pre-defined dates or date ranges, or for a Specific Date or Custom Range. Select the All check box to include all forms of payment on the deposit slip, or select the check boxes of only those forms of payment that you want to include on the deposit slip. Click (or tap) Preview to view the deposit slip before you create it as a .pdf file, and then click (or tap) Print. Click (or tap) Print to generate the deposit slip as a .pdf file. Note: Depending on the date range of the report and the number of records that must be checked, it may take 1 - 5 minutes for the report to load. Please be patient. If you leave the page before the report loads, you will have to regenerate the report.